We’re excited to announce major updates and improvements to DNA Matching rolled out today for all our users. 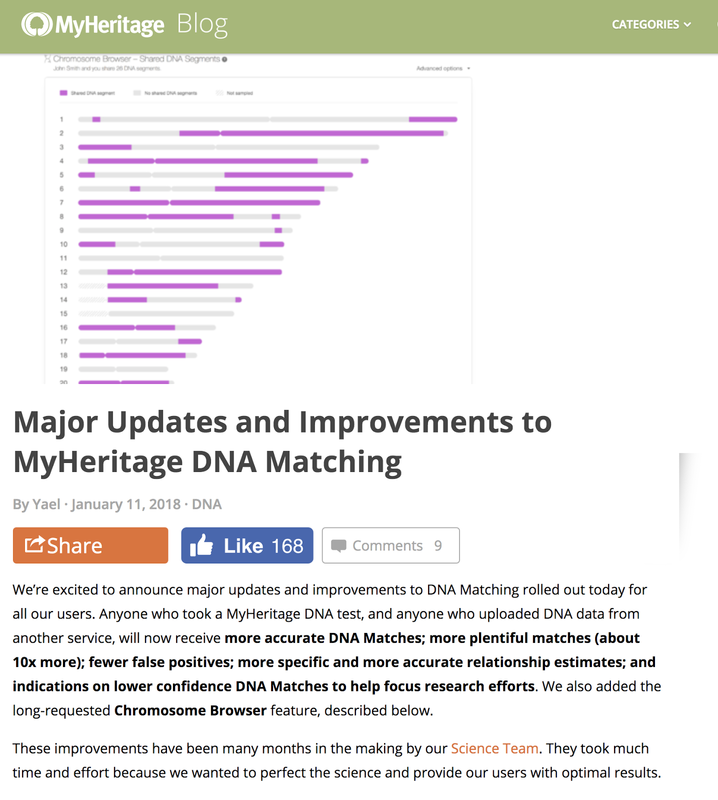 Anyone who took a MyHeritage DNA test, and anyone who uploaded DNA data from another service, will now receive more accurate DNA Matches; more plentiful matches (about 10x more); fewer false positives; more specific and more accurate relationship estimates; and indications on lower confidence DNA Matches to help focus research efforts. We also added the long-requested Chromosome Browser feature, described below. These improvements have been many months in the making by our Science Team. They took much time and effort because we wanted to perfect the science and provide our users with optimal results. The blog post goes into detail and answers questions such as "What is DNA Matching?" and "How does DNA Matching work?" The post also explains how the matching technology was improved. The post is quite detailed. If you have taken a DNA test, particularly one from MyHeritage, I suggest you read this post. One of the outstanding demonstrations of current computer power was the Google-DeepMind’s AI system AlphaGo's defeat of a human professional for the first time last year at the ancient board game Go. Subsequently, Google's AlphaGo Zero surpassed the strength of AlphaGo in three days by winning 100 games to 0, reached the level of AlphaGo Master in 21 days, and exceeded all the old versions in 40 days. See Wikipedia: AlphaGo Zero. If you aren't familiar with the ancient Chinese game of Go, you should read "What is Go?" from the American Go Association. But how impressive is this really? If you could do anything 4.9 million times, you’d probably become a master too. The ability to iterate a larger number of times on a small time scale is what makes neural networks such useful tools in artificial intelligence. Artificial Intelligence has been a buzzword for a long time and is generally defined as the theory and development of computer systems able to perform tasks that normally require human intelligence, such as visual perception, speech recognition, decision-making, and translation between languages. From a genealogical perspective, the increasingly available "record hints" provided by several online websites such as FamilySearch.org, Ancestry.com, MyHeritage.com, and Findmypast.com, are more or less an implementation of an artificial intelligence program. The main limitation of the hints being the lack of indexed data and the variations in the way genealogical information has been recorded. Obviously, one huge limitation is an accurate and reliable method of handwriting recognition implemented for genealogical research. With the rise of huge, integrated, online family tree programs that compare and correlate information from millions of users, there is a possibility that more sophisticated artificial intelligence type programs could begin to build a reliable universal family tree. 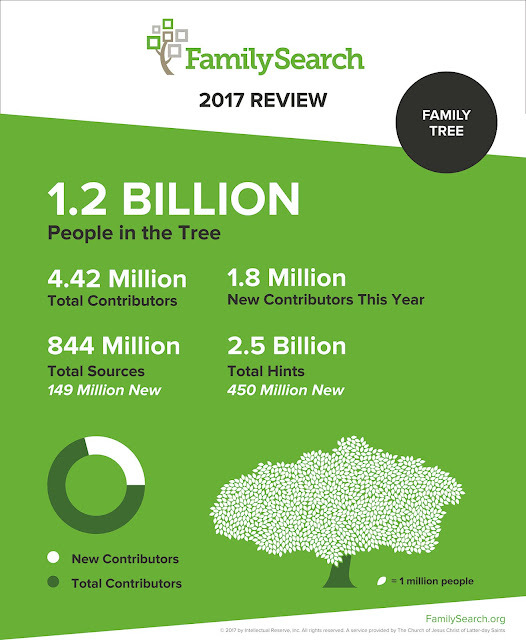 The FamilySearch.org Family Tree has the potential to begin such a project, but there is presently no way to integrate information from the millions of other online family trees on other programs and there is definitely no way to evaluate the reliability of the information presented in all those family trees. Another basic limitation in undertaking such a project is the unreliability of existing historical data and the fact that all such data is scattered around the world in fragments which are more or less still unavailable. You could be persuaded to believe that current DNA testing could solve part of the problem. Even assuming that universal DNA testing would be possible or desirable, the results from the testing would have to be correlated and evaluated. What would a universal family tree look like? I think any universal family tree would need to be focused on the supported connections between individuals now shown on many well-sourced family trees presently available. For example, as I noted above, there are several websites that provide record hints. 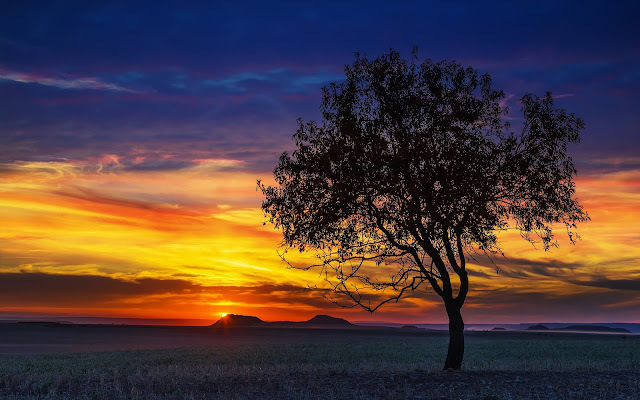 When these record hints are supported by reliable DNA matching data, there is a good possibility of establishing a basis for the foundation of a universal family tree. For example, let's suppose that existing data supports my relationship to my immediate family and some or all of the connections are supported by DNA testing data assuming further that all of the family members participate. This basic, supported information can then become the basis for constructing additional reliable connections. Could an artificial intelligence program be written to build such a family tree? Probably, assuming the data was made available and not blocked by current attitudes towards privacy. But these are big assumptions. 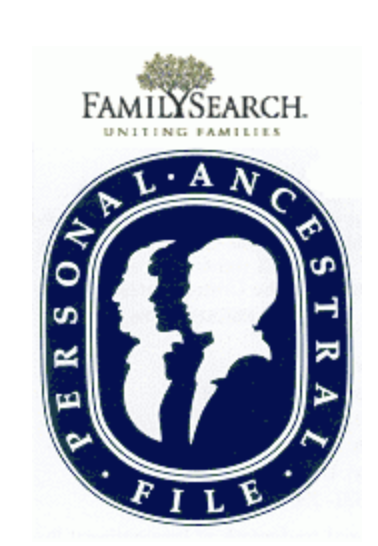 Presently, the best that we have are the major genealogical database and family tree programs. 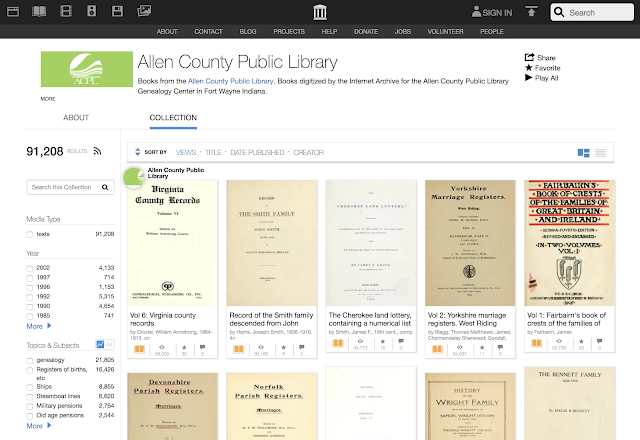 The Archive.org website has over 91,000 fully digitized and fully searchable books from the well-known Allen County Public Library. That fact alone should put the Archive.org website on every genealogist's top ten list of valuable websites. But very few genealogists are aware of the magnitude of the number of books available. As of the date of this blog post, the Archive.org website has 15,317,776 fully digitized books and every one of those books is in the public domain and can be downloaded to your own personal device. The question always comes up about how many of those books are valuable to genealogists? Since it is difficult to determine if a particular book is or is not useful for any specific research project, the question cannot be reasonably answered. If you search on Archive.org for "genealogy" you get about 132,000 items but that is only books that have been cataloged with the word "genealogy" and does not include a publication that does not use that word. For example, if I search for books using the terms "Tanner family," I get all sorts of items, some related directly to my family line. It is more useful to search for books of genealogy records. 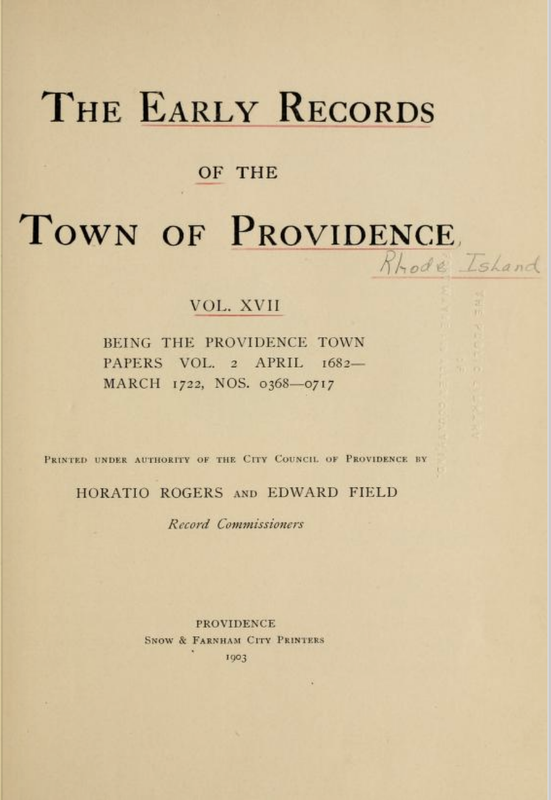 If I search for "Rhode Island history records" I get several useful books containing early Rhode Island history and records. Such as the following. Searching on the Archive.org website is very similar to searching in any very large library. You must use all of your research skills to guess the way the items were and are cataloged. I recently needed a specific book for research and could not find a copy in any nearby library, but I did find a copy on Archive.org and was able to check out the book through its companion website, OpenLibrary.org. Here is a quote from a recent blog post entitled, "Digital Books on archive.org." Archive.org is the website that offers free public access to all sorts of materials uploaded by users, collected by the Internet Archive, and digitized by the Internet Archive. Archive.org includes books, music, video, webpages, and software. OpenLibrary.org, a site that is maintained by the Internet Archive, is a catalog of books with the mission to offer “One webpage for every book.” This open source catalog site, started in 2005, is editable by its users and has many code contributors. 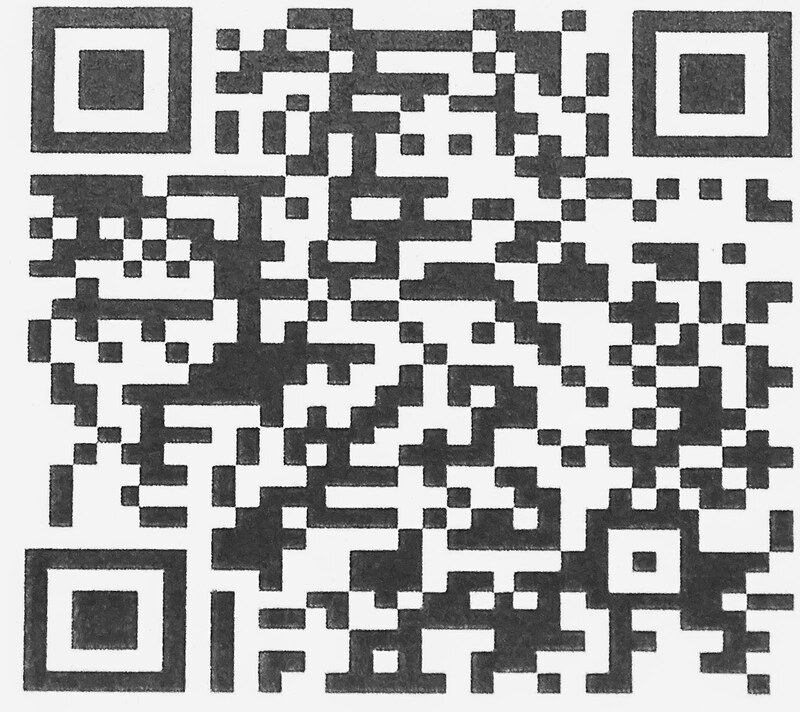 It links to various resources about that book, for instance, links to amazon.com and betterworldbooks.org to buy the book, to local libraries that own the book, to archive.org for print-disabled access or to borrow a digitized version of the book, and to other sites that have digital versions. Here is how the library works. The Internet Archive is able to make available for loan older books that are not available in ebook format. In every case, an authorized print copy has been acquired and made unavailable for simultaneous loan. I use the OpenLibrary.org to read books that I cannot find in print or in a library. You must read the story of why a thirteen-year-old boy's interest in his ancestors became a passion that ended up with him becoming the CEO of one of the largest, if not the largest, genealogy company in the world. Quoting from a blog post entitled, "Our CEO Gilad Japhet Tells the Stories of His Ancestors Who Were Victims of the Holocaust:"
MyHeritage Founder and CEO Gilad Japhet reveals his personal history in honor of this year’s International Holocaust Remembrance Day, in memory of his ancestors who were victims of one of the most tragic human experiences this world has ever witnessed. 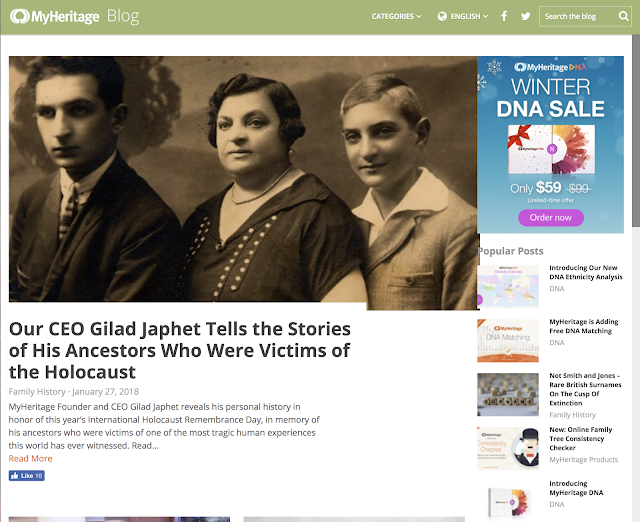 To begin to understand MyHeritage.com, you need to read Gilad's story. It has been my privilege to become acquainted with Gilad over the past few years and I consider him my friend. He is generous and kind and is one of the most motivated and intelligent men I have ever met. I am honored to have had a chance to associate with him and all of the wonderful friends I have at MyHeritage. I will surely miss seeing them this year at RootsTech while I help to digitize valuable probate records in Maryland. I would like to thank Gilad for all the kindness he has shown to me and for his wonderful and inspiring story. If you would like to learn more about MyHeritage.com, please take time to view the videos on the MyHeritage YouTube.com Channel. The RootsTech 2018 mobile app, sponsored by WordPress, is now available for download from the App Store and the Google Play Store. The mobile app allows you to browse the conference schedule, build a personalized agenda, find speaker information, connect with other attendees, and much more! Although I will not be at #RootsTech this year, I have used this app in year's past and it is a great help in organizing what you do each day of the Conference. Complete instructions for the app are available on the the #RootsTech blog post entitled, "7 Ways the Mobile App Will Enhance Your RootsTech Experience." MyHeritage.com has added some significant new collections of documents. You can read more about these collections in the MyHeritage blog post entitled, "New Historical Records Added in January 2018." Here are some descriptions of the newly added records from the blog post. MyHeritage has recently added one of the largest collections of digitized U.S. yearbooks in existence with over 36 million pages in more than 253,000 yearbooks, and it’s partially exclusive to MyHeritage. These records are valuable to anyone who wants to learn more about their relatives’ teenage experiences in high school. The collection provides extraordinary genealogical coverage of high school students and teachers over a period of 90 years. Yearbooks are excellent sources for genealogy research — you can find personal portraits and group photographs of your relative, as well as a list of sports, clubs and other extracurricular activities they may have been involved in. If you’re lucky, you may even find a biography written by or about them. Newspapers are an important resource for genealogy and family history research. They contain obituaries, birth, marriage, and death announcements, and other vital records. 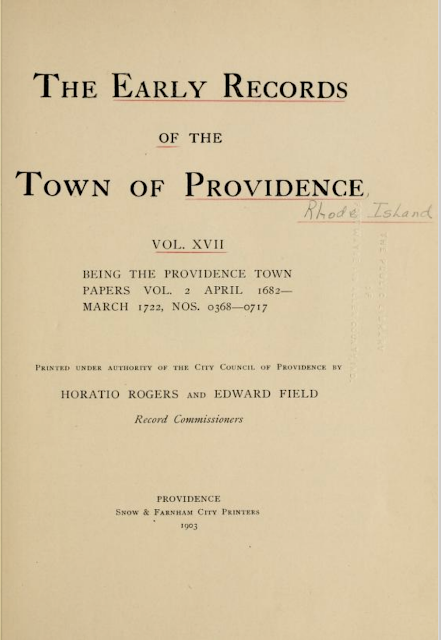 They also provide society pages and local stories filled with rich information about community events and people who lived there. At MyHeritage, we set up an OCR (optical character recognition) lab in Utah to process historical newspapers and books at high capacity. The new newspaper collections listed here are among the first outputs of our OCR lab. This exclusive collection includes 1,014,820 pages in 44 newspaper titles from Indiana and it spans the years from 1847 to 2009. This exclusive collection includes 4,604,759 pages in 88 newspaper titles and it spans the years from 1793 to 2009. We’ve recently updated the Sweden Household Examination books collection by adding more than 38 million records from additional years that we didn’t have before! 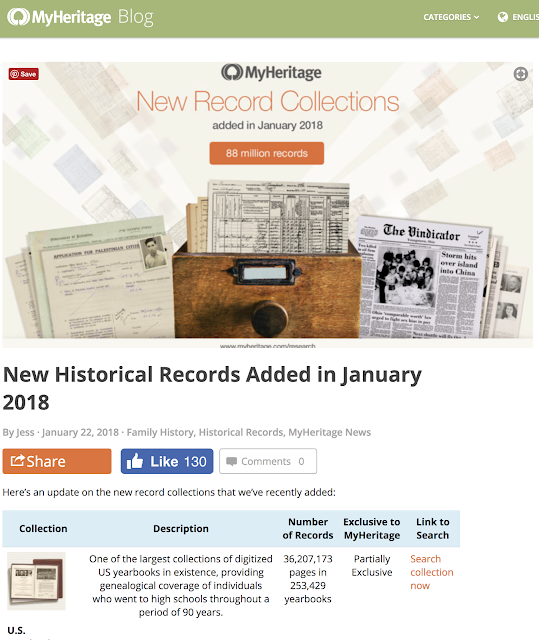 The new records cover 1860-1880 and 1920-1930 and these additions are exclusive to MyHeritage. We’ve produced an every-name index to nearly 8 million images. With over 86 million records, The Household Examination Books on MyHeritage are the primary source for researching the lives of individuals and families throughout the Parishes of Sweden, from the late 1600’s to modern times. An exclusive collection containing the names of all individuals listed in the German 1939 census who lived in a household where at least one person in the household had a Jewish grandparent. Many of these people were killed in the Holocaust and this census is the last written trace of them. These approximately 410,000 individuals are from the supplement census cards recording each person’s Jewish background. This collection of Mandatory Palestine Naturalization applications is a unique compilation of over 206,000 records documenting the efforts of individuals, mostly Jews, and sometimes their entire families, to establish citizenship in Mandatory Palestine, which was under British administration at the time. The exclusive collection contains photos, histories, passports, and other various forms providing details for each applicant. The naturalization applications were handled by the British Immigration Department. We hired a group of more than 50 people in Israel to transcribe this special collection, and have made an exceptional effort to transcribe both the English and the Hebrew names in every record. 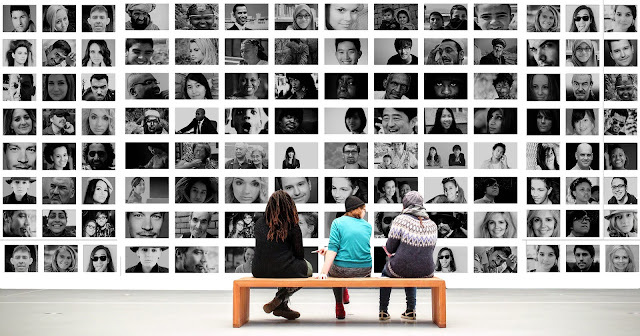 Genealogists focus on both present and past family relationships, a topic that conceptually involves every person who lives on the earth and every person who has ever lived on the earth. As I have pointed out in previous blog posts, dating back into antiquity, genealogists have developed a structured system of investigating and recording our common familial heritage. This traditional approach to family history was primarily based on a Western European lineage model and ultimately derived from royal genealogies. Once this basic methodology was developed, there was very little change in the way genealogists did their work. In the United States and Great Britain, the traditional methodology began to change slowly beginning with genealogist Donald Lines Jacobus and those that followed his methodology as set forth in his book Genealogy as Pastime and Profession. Jacobus, Donald Lines. Genealogy as a Pastime and Profession. Baltimore, Maryland: Genealogical Publishing Company, 1999. The methodology set down by Jacobus has become the basis for the current "traditional" method of discovering and recording genealogical data. However, during the past twenty or so years, technological changes have begun to radically affect our traditional static view of genealogical methodology. First, I guess it would be a good idea to define "methodology." It is defined as a set or system of methods, principles, and rules for regulating a given discipline, as in the arts or sciences. This genealogical methodology involves a multistep process of identifying and locating pertinent historical records, extracting the information from those records, evaluating the extracted information, and recording that information in some format. Advances in information technology directly impact this information-based process. Due to the impact of technological changes, genealogical methodology has become fragmented causing some genealogists to accept and incorporate the technological changes and others to resist those changes. 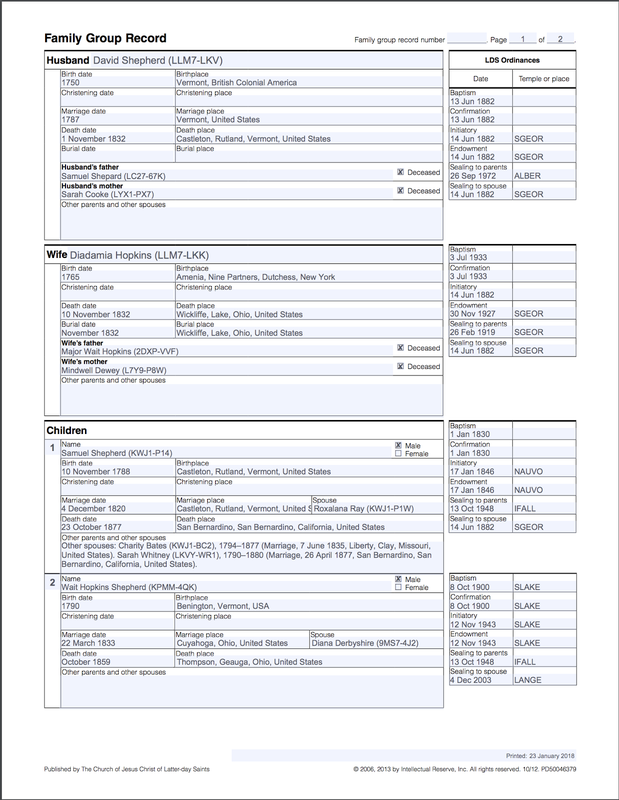 In the past, many genealogists developed paper-based forms for recording genealogical information such as traditional family group sheet and pedigree charts. Most of the efforts so far in "computerizing" genealogy have focused on replicating the original paper forms in a digital format. Because the paper forms are familiar to those involved in research, it is comfortable to have an electronic version of a traditional paper form. For example, here is a screenshot of a "family group record" from the online website of FamilySearch.org. 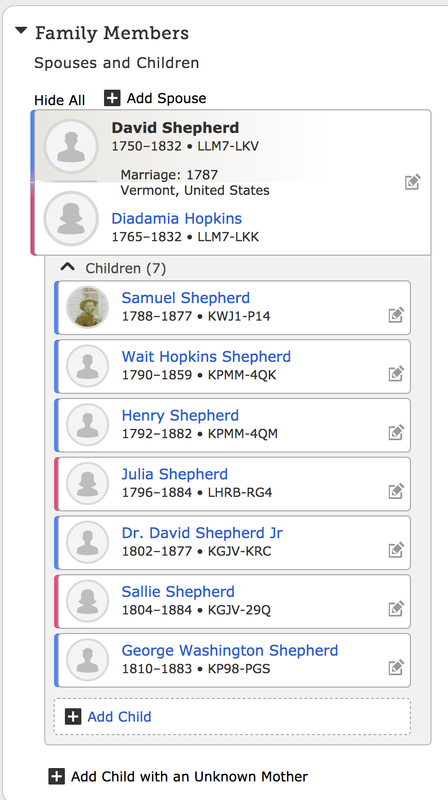 Here is a depiction of the same family from the FamilySearch.org website. Each of the individuals has their own "individual" record that corresponds to the information contained in the traditional Family Group Record (FGR). There is a one-to-one correspondence between the information contained on the FGR and the same information on the website. The main change from a paper form is the expansion of the number of characters that can be recorded in the various fields. Although alternative information such as occupation, the cause of death, education, sports, hobbies, and other interesting facts about a deceased person are available, they are delegated to a separate section of the program and there is no way to view the individual as an individual with all the accompanying information. The representation of the family depicted in this format also simply lists multiple spousal relationships even when those reflect a traditional family organization such as when one spouse dies and the remaining spouse remarries. Nearly all of what we see online and in computer programs designed for genealogists is simply an electronic reproduction of the "traditional" paper-based genealogical forms. Other genealogical programs have interfaces that more or less fragment the information about a particular individual or family in a similar fashion. In every case, individuals are represented as a collection of facts that directly correspond to those supported previously by paper forms. In some programs, there has been an attempt to display relationships through the use of graphics, even three-dimensional family tree structures. Rather than simplify and expedite the entry and analysis of information, these programs end up adding another level of paper representation. In the end, all of the programs tend to represent the multifaceted lives of our ancestors as a set of field entries that need to be filled in. What do you know about your father (mother, aunt, uncle, etc.)? Where was your (relative) born? Who were the members of his or her family? Do you have any photos or stories you can remember about this relative? 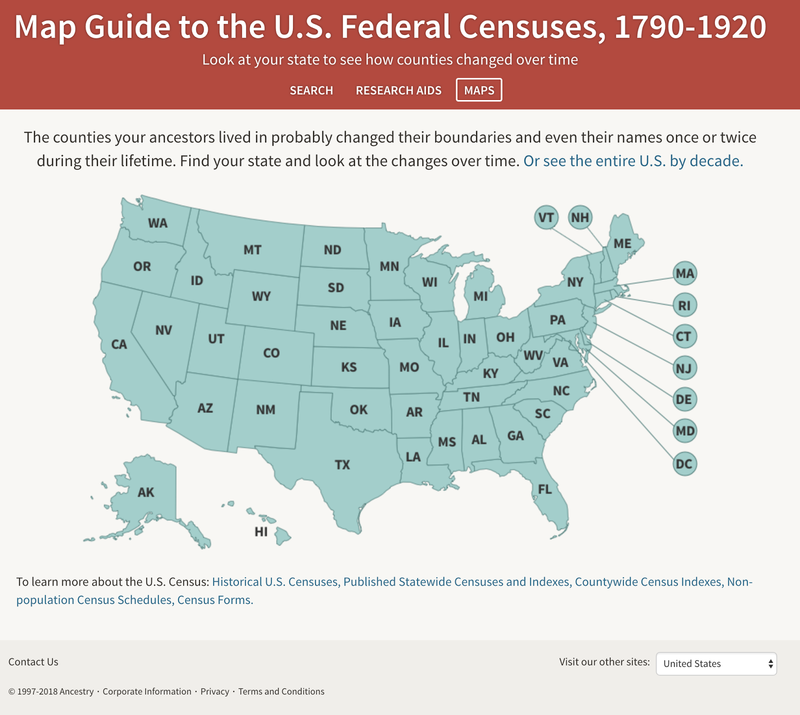 We have found a U.S. Census record that seems to have information about your (ancestor). What do you see in this record that might help add information about this person or family? Here is a timeline of the time when your ancestor lived? Do you know where the ancestor lived? In other words, we break out of the shackles of the paper-based view of genealogy and start putting the information into a historical context and do this by begging a narrative. What do we end up with? Essentially a website dedicated to a family with links and photos and stories. At the same time, we could add in some artificial intelligence that could begin to correct the information entered. For example, an extensive expansion of the error messages now generated by some programs. The interesting thing is that all this is now available. Rather than providing a confusing pile of information, how about using the computers to organize, help evaluate and record the information in a way that leads us through the process rather than requiring years of experience to get started? One of the fundamental experiences of our universal human experience is the diversity of our physical characteristics. To a large extent, our societies have been based on these superficial differences, even those as inconsequential as height and weight. In the United States, race relations based on arbitrary divisions such as national origin have been the cause of riots, oppression, and a huge civil war. Inter-race relations are a constant and contentious background news topic. At the same time, artificial differences based on arbitrary political boundaries have caused even more problems and contention. In the United States again, people from certain politically defined areas of the world are automatically subject to prejudice and oppression. When I was younger, we fought a war against a country that was constantly vilified as the "enemy" but now, we are "friends" and trade partners. Perhaps the war could have been avoided had we been more interested in trade than policing the world. So, the differences highlighted by the genealogical DNA ethnicity tests involve only a minute portion of our total DNA and so the actual differences between individuals are slight. These results imply that we are significantly different from those people with whom we should do not share any DNA from test results. However, in reality, we are all very closely related. Currently, in part because of these tests, we can justify being even more divided, once again based upon extremely small and superficial differences. In addition, the current DNA tests assign us to ethnicities that are composites. So for example, one DNA test indicates that I am 74% English. But what does it mean to be English? Who is included in this category? If it is meant to include those who live in England then the results are misleading because there is a hugely diversified population in England. Unfortunately, in most cases, we are not supplied detailed information concerning how these categories are selected. In any event, the percentage of the entire human genome used to calculate relationships is extremely small. By looking at the results of one of my DNA tests, I could conclude that I am related to people in many countries which are presently extremely unfriendly with the United States including some where wars have been going on for a considerable time. We are, in a very real sense, fighting wars with my relatives. Promoting extensive, world-wide DNA testing may end up having some rather interesting results. For example, think about how world history might have been altered had cheap, easy DNA testing been available a hundred years ago. Genealogists who look at DNA testing as only another tool for finding relationships and determining the identity of ancestors are really ignoring the more revolutionary aspects of the entire movement. Welcome to the 2018 DNA Innovation Contest hosted by Grow Utah! This contest is for new and innovative products or services that will improve the use of individual DNA data in the fields of ancestral history, personal history and family health history. This contest is to promote innovation, entrepreneurship and business growth in this field. All innovators are invited to bring forward their best and brightest ideas to meet this challenge! From among the applicants, 6-10 finalists will be selected to pitch their innovations at the RootsTech Family History conference. The judges will then pick 3 winners and the cash and service prizes will be awarded! This is a totally free contest without any strings attached! 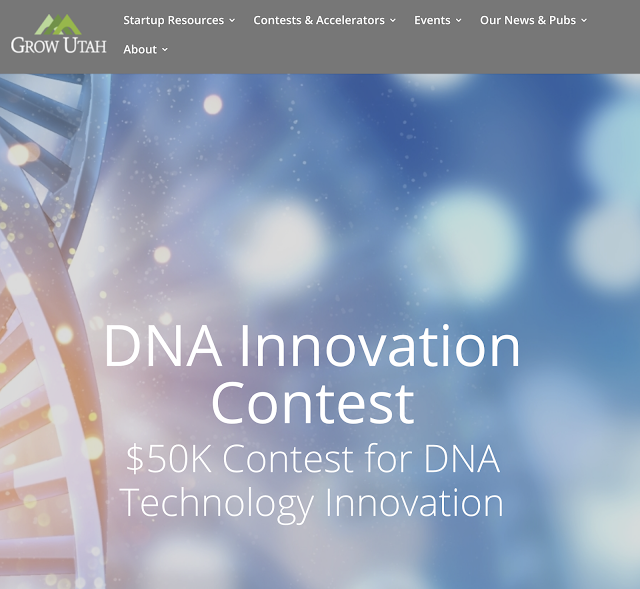 Grow Utah is a privately funded non-profit organization and is dedicated to fostering innovation that drives entrepreneurship. Our initiatives focus on emerging technologies and applications that will lead to significant business and job creation. We have been holding innovation contests since 2008 and have awarded over $1M in cash and services to 100+ entrepreneurs! Click Here to read about the Contest. The series also includes several thousand records relating to deceased allied airmen, whose bodies were found by or near to their aircrafts which had been shot down. To some degree, these act as a record of death as the individuals were never prisoners of war as such. The number of cards for each individual varies from one to fifteen, but in most cases there are just one or two. This ambitious project will continue until the end of 2020 and for the main we are working our way through the series alphabetically by surname. This page, under ‘Arrangement’, provides a link to the projected completion stages of the project, subject to change. 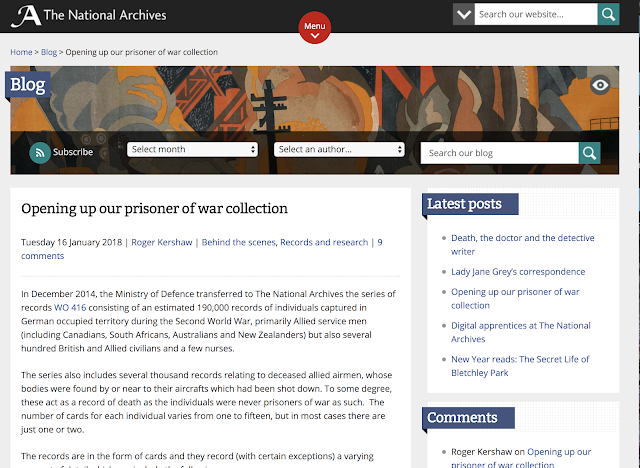 Fifteen per cent of the collection has now been catalogued by name of individual; we have loaded this information on Discovery so researchers can access the material on site or arrange for digital or paper copies to be sent to them. We are offering a paid search service for uncatalogued pieces for those who do not want to wait until the project has completed: details of this service are available at piece level descriptions in Discovery. Can we rely on the internet? I received the following comment to a recent blog post. While not disagreeing with the point of your posting I would question the wisdom of the way the computer industry is going. On a much more disturbing note than whether a single program will work on a modern system is the dangerous reliance on cloud storage and on line programs. Many might see this as progress but really it is a regression to a time when only huge companies controlled computers. 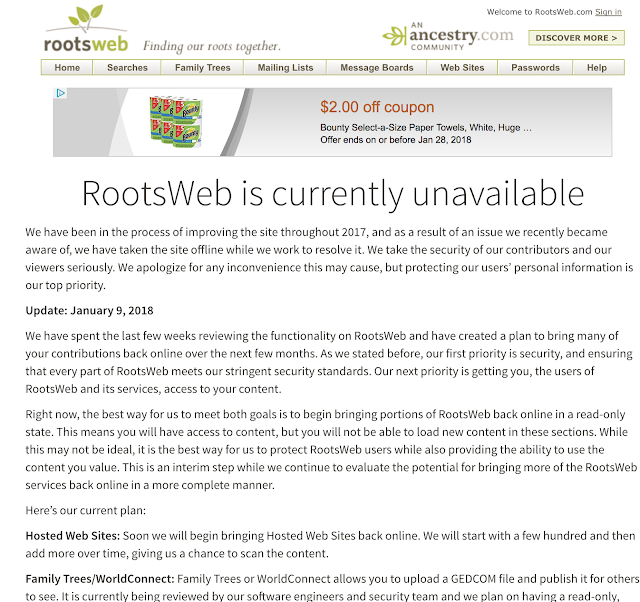 The problems with Rootsweb and indeed Ancestry’s frequent other problems highlight the dangers of relying on the internet and such problems are going to get worse. Yes people who use old computers and old programs may have a few minor problems as you have described but those are nothing compared to the enormous problem caused when online provision fails. The local problems can normally be quickly solved, even if this means resorting to a saved back-up but when the on line program or storage fails even the back-up may be inaccessible. Perhaps someone will explain to me what protection is in place for when the next Carrington Event hits. Most people using old fashioned computers will be safe as it is likely their computers could be switched of at the time, but on line servers may be subject to a disastrous failure. Don’t misunderstand me I am not saying do not embrace the new technology and online services but rather do not rely on the internet to store what you think important. Ensure you are responsible for that by having the equipment and storage of your data under your control locally. This longer comment includes references to several modern issues including the reliability of online data storage, catastrophic world events and the viability of the internet. Taken to its extreme, the position taken by this comment reflects the rather extensive "prepper movement" currently very active in our society today. I am certainly not saying that the commentator is a "prepper" but the idea that vast networks including food distribution, power grids, and other such failures require us to be "self-sufficient" is not just an idea limited to backing up our data on our computers. Here is a short definition of the trend from a Wikipedia article entitled, "Survivalism." Survivalism is a primarily American movement of individuals or groups (called survivalists or preppers) who are actively preparing for emergencies, including possible disruptions in social or political order, on scales from local to international. Survivalists often acquire emergency medical and self-defense training, stockpile food and water, prepare to become self-sufficient, and build structures (e.g., survival retreats or underground shelters) that may help them survive a catastrophe. Hmm. Given that definition, I have been a survivalist for a very long time. The Church of Jesus Christ of Latter-day Saints, of which I am an active member, has long urged its members to store a supply of food and essentials in the case of a disaster or other problem. During my own life, our family has always had some long-term storage and during times of limited income, have benefited from always having sufficient food and other essentials. The Church uses the term "self-reliance" and includes basics of education and social and emotional strength. As the comment points out, it is not a good idea to rely on one form of backup for any computer related data. The people who rely on an old program such as Personal Ancestral File either to store their data or for current work are counter-survivalists. They are ignoring the very real danger that they will lose valuable data. Worrying about the viability of the internet and then telling people to continue to use an abandoned software program makes no sense at all. There is an interesting reference to the Carrington Event. Here is a Wikipedia quote from an article entitled, "Solar storm of 1859," explaining what happened. The solar storm of 1859 (also known as the Carrington Event) was a powerful geomagnetic solar storm during solar cycle 10 (1855–1867). A solar coronal mass ejection (CME) hit Earth's magnetosphere and induced one of the largest geomagnetic storms on record, September 1–2, 1859. The associated "white light flare" in the solar photosphere was observed and recorded by British astronomers Richard C. Carrington (1826–1875) and Richard Hodgson (1804–1872). The now-standard unique IAU identifier for this flare is SOL1859-09-01. Why would "old-fashioned computers" be exempt from the damage from such a storm. The accounts of the storm indicate that some telegraph traffic was interrupted. The question is what would have to your computer if there were a world-wide catastrophic disaster? Well, there would be a lot of damage and running PAF on a Windows XP machine is not a solution. I do rely on the internet to store what I think is important. But I also store all my data locally on three independent 8 TB hard drives. I also rely on programs such as FamilySearch.org and other online databases with their own backup programs to protect my data. I the parable of the wise man who built his house on the rock and the foolish man who built his house on the sand applies to this situation. Using PAF is definitely building on the sand. Personal Ancestral File is only mostly dead, long live PAF! As Mad Max says, there is a big difference between being dead and being mostly dead. Apparently, Personal Ancestral File is only mostly dead. 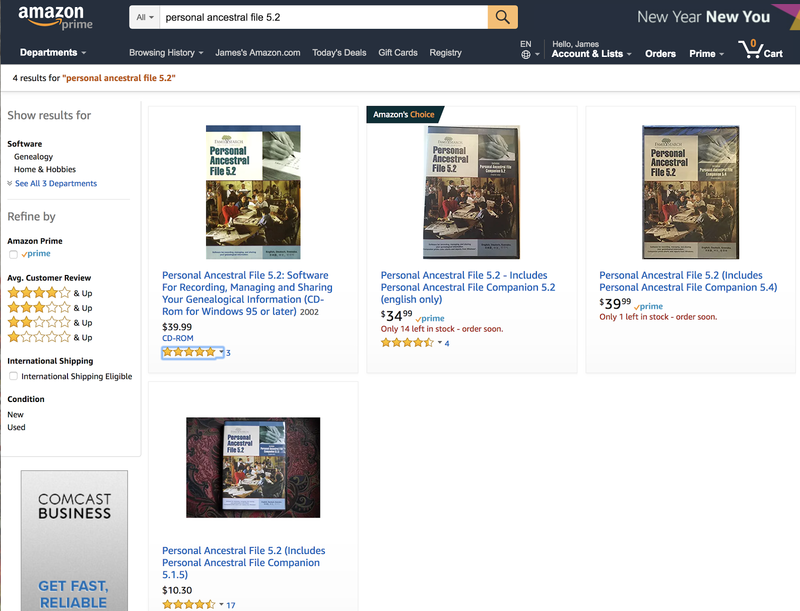 I had several people point out to me that Personal Ancestral File was still available at some Family History Centers, on websites, and on CDs for download. When I get time, I will download a copy, which I could not find on my first go around and write about using the program with Microsoft Windows 10 or whatever. One thing I thought that was interesting is the fact that people indicated to me that the program was available on CD. Only some of the newer computers come with a CD drive by the way. None of the new Apple computers or devices now come with a CD or DVD drive. You might not have noticed, but that technology is also dying rapidly in competition from online streaming and flash drives. I do have a CD drive hooked up to my iMac, but I had to buy it separately. You might also try to load a program from a CD onto your tablet or iPad if you want to see what is really happening. By the way, Apple is merging both their Mac OS X operating system and their iOS operating systems. Google is merging its mobile Android system with Chrome on its Chromebooks. Microsoft has so far failed to make any headway into the mobile operating system market. But Windows is still the dominant operating system worldwide for desktop and laptop computers. See "Operating System Market Share." But the huge mobile market is dominated by Google Android and Apple iOS. See for example, "Global mobile OS market share in sales to end users from 1st quarter 2009 to 2nd quarter 2017." This is a situation where Microsoft is winning the battle but losing the war. The real war is in mobile computing. Both Apple and Google recognize this and that is one reason why they are moving to merge their operating systems. The issue with Personal Ancestral File is much more fundamental than merely whether or not it will operate on a Windows machine. The real issue is that future operating systems will not be Windows-like, they will be Android or iOS like. Can you run PAF on your iPad or tablet running Android? Try it. Yes, you can probably pick up a copy of PAF in a Deseret Industries store around the U.S. But is that a viable outlet for the software you want to use to archive your days, months and years of genealogical research effort? For me, PAF is the genealogical symbol the digital divide; the outward and obvious indication that huge segment of the genealogical community as simply out of touch with technology. That is the main reason this subject comes up periodically and will continue to be a subject for comment until the program really dies. Does Personal Ancestral File Still Function? Back in 2014, I wrote a blog post entitled, "Why does Personal Ancestral File (PAF) refuse to die?" I think a quote from the earlier blog post is needed to start the process of bringing us up to 2018 and Personal Ancestral File. Here is me quoting me. Hmm. Now here is the question. 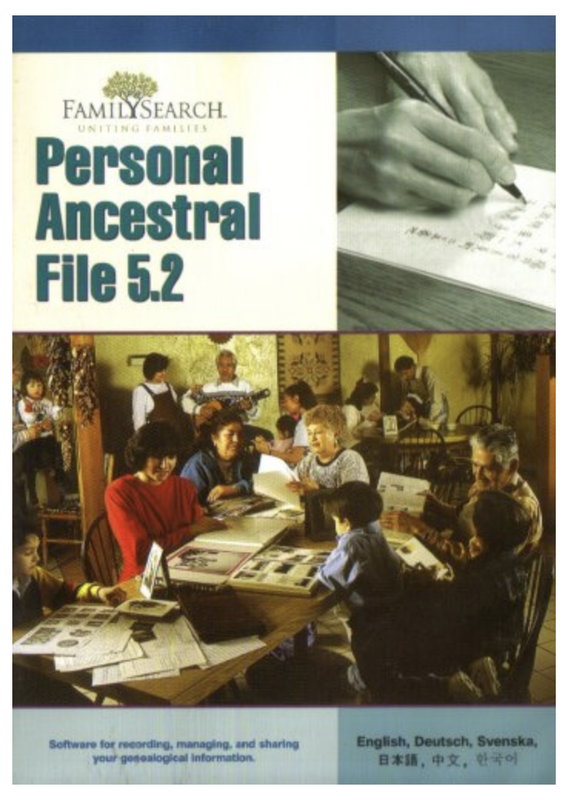 Is Personal Ancestral File (PAF) all the program most need and want? My question is a little bit different: does PAF still work on a new computer? I just happen to have a PC running Windows 10 which was updated during the time I was writing this blog post. So I began the task of finding a downloadable version of PAF to see how it works on a relatively new computer running the latest Windows upgrade (until tomorrow when another upgrade comes out). As you can probably guess, I am reasonably familiar with searching online. However, after spending a considerable time looking, I was unable to find a reasonable website that had a PAF download. So I couldn't verify for myself whether or not the program will still run on the latest version of Microsoft Windows 10. However, the fact that I had no success in finding a copy online indicated that when all the old copies are gone, the program will quietly die a real death. But then, I had a thought. What about Amazon.com? It is still for sale!! But not only is it for sale, the asking price is more than both the brand new, fully-supported, up-to-date, programs that support all the old PAF files: RootsMagic.com and AncestralQuest (ancqueste.com) Now using an old, abandoned, pernicious program seems even more illogical. If you want to read recent reviews of PAF please see GenSoftReviews.com. Here is a five star rating from January 3, 2018, that points out the inconsistencies in the defense of PAF but still lauds the program. I have been using PAF since its beginning and have and will continue to use it until no computer will any longer support it. I just finished copying PAF5 to my new computer running the newest version of Windows10 and it runs beautifully and even faster than on my old computer. The important thing is you must continuely make new gedcom files as you update your genealogy data. Then often upload the latest PAF gedcom file into a commercial software program of your choice. Some like RootsMagic and Legacy are 2 programs that even allow you to import your PAF file into their programs. There may be others. If the time comes then that PAF can no longer be supported, you still have your complete database to point of the last GEDCOM upload into your commercial paid for software. It is more than worth the money and these extra steps to be able to have the simplicity and ease of use of PAF and not be concerned about losing all the research and effort you’ve expended. Unfortunately, this reviewer wants you to buy the real commercial program to make sure you don't lose all your data. Why not just use the commercial program? By the way, the program is no longer supported. 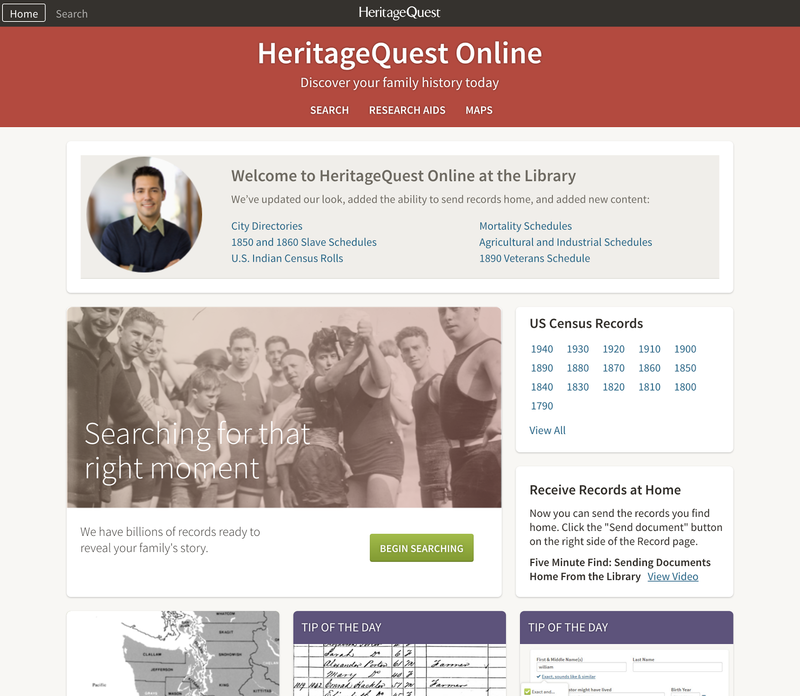 HeritageQuest is one of the Ancestry.com family of websites in conjunction with ProQuest.com. It is available through local public libraries where the library has a subscription. I gain access by having a library card through the Maricopa County (Arizona) Library System. We pay an annual fee for our Library Card because we now live outside of Maricopa County. There are a number of county and city libraries that will allow non-residents to have a library card upon the payment of a fee. With my Library Card, I can use all of the Library's online resources except those requiring the use of an in-library computer. Some time ago, the website was partnered with Ancestry.com and converted into a watered-down version of the Ancestry.com website with connections to certain pages for searching on the regular Ancestry.com website. 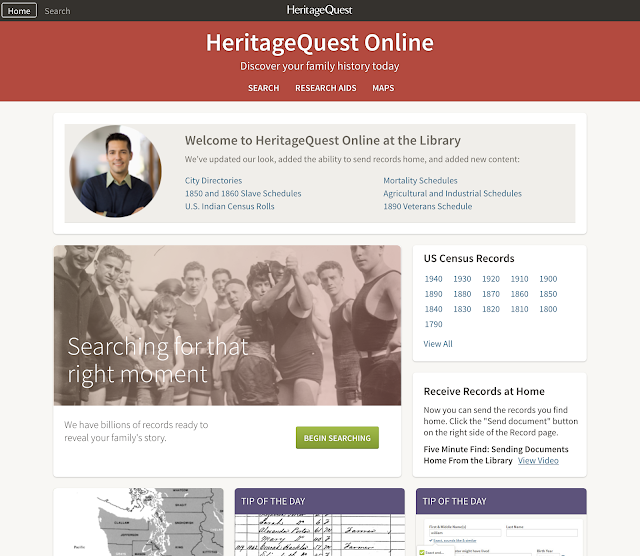 It does give access to many records that otherwise would require you to be physically in a library using the Library Edition of Ancestry.com, but it also lost some of the really valuable assets previously provided by ProQuest.com. Notwithstanding this limitation, there are still some valuable resources on the website not easily obtainable elsewhere. For example, there is a comprehensive Map Guide to the U.S. Federal Censuses, 1790-1920. This resource is apparently not available on the Ancestry.com website. If you are serious about research, you need to visit your local public library and even the libraries where your ancestors lived or might have lived. These local resources can be helpful in learning and research. 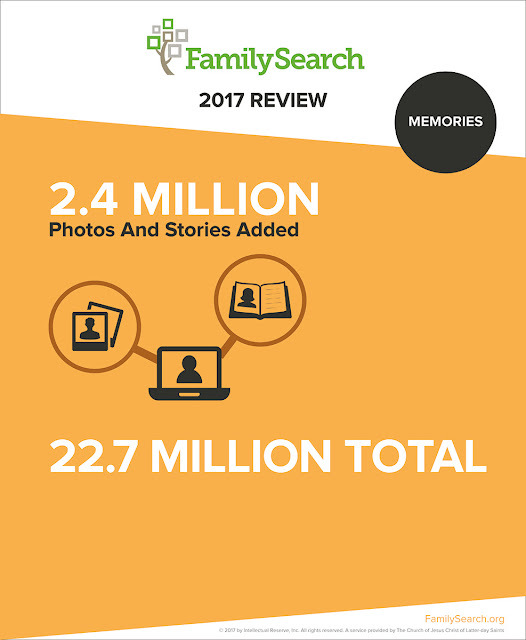 FamilySearch published a series of five infographics detailing statistics for the year 2017. 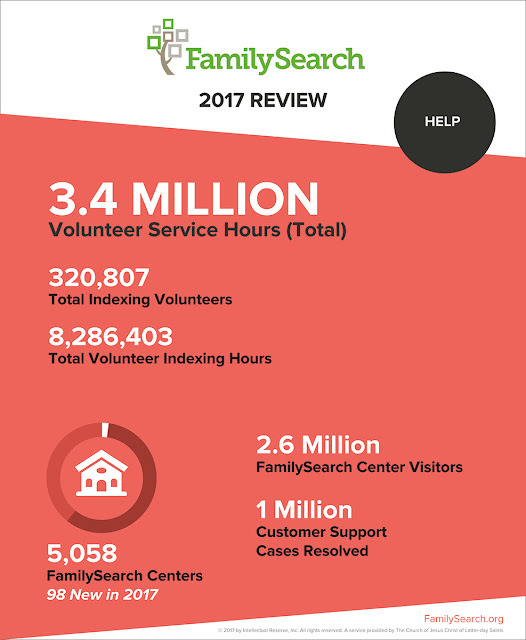 Each of these infographics addresses a different aspect of FamilySearch activity during the year. Here are the details for the image above about the FamilySearch.org Family Tree. Here are the rest of the infographics with their individual explanations. I was privileged to contribute a few hours as a volunteer this past year. This year, both my wife and I are working full-time as missionaries digitizing records at the Maryland State Archives. Sometimes these numbers are so large as to be almost meaningless. The real meaning comes when you use the website to find one of your ancestors. 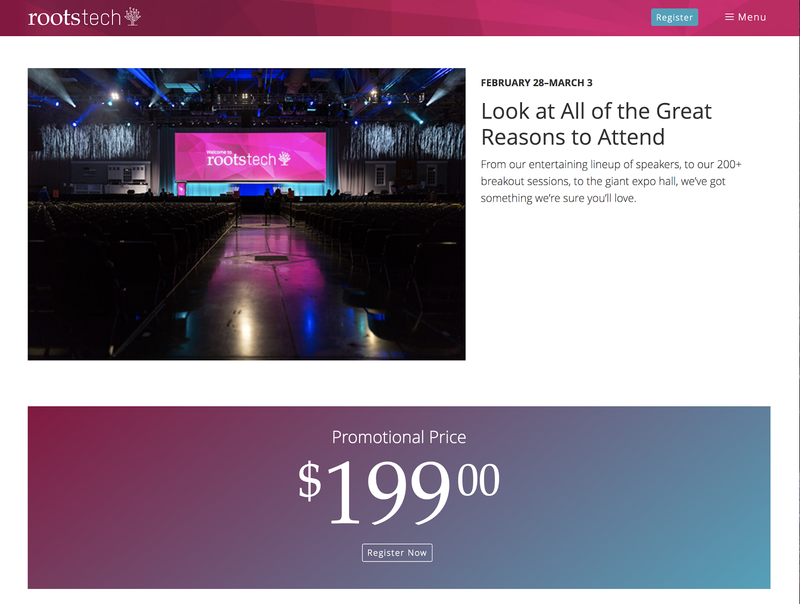 The annual # RootsTech 2018 conference will be held from February 28 to March 3, 2018. Registration is still open. 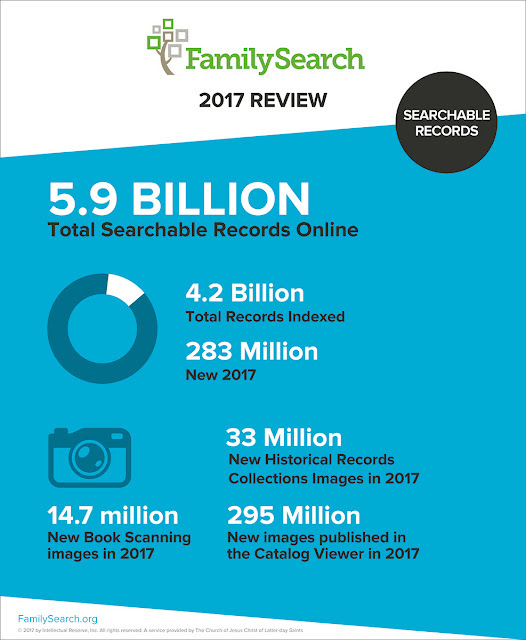 During the year 2018, my wife and I will be serving as full-time FamilySearch missionaries digitizing records at the Maryland State Archives in Annapolis, Maryland. We are proud to be part of the FamilySearch effort to preserve our family heritage. 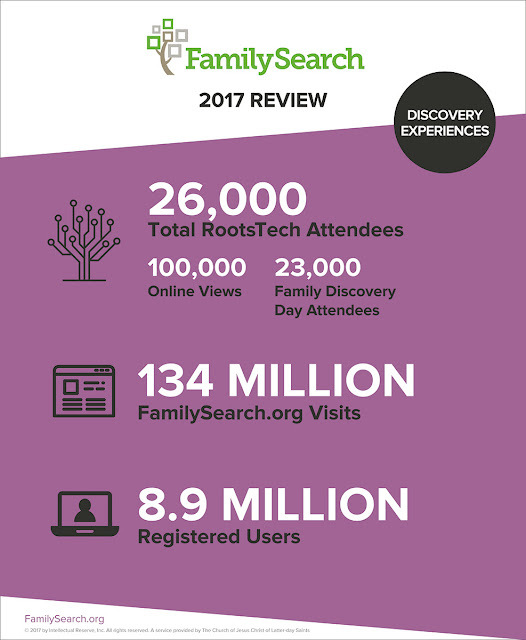 #RootsTech 2018 is ramping up. Although I will be watching from Annapolis, Maryland, my heart will be in the Salt Palace along with 20,000 or so thousand of my closest friends. FamilySearch has announced a number of really interesting and impressive Keynote Speakers. The latest is Natalia Lafourcade. Here is a little bit about this celebrity. Natalia Lafourcade is a Mexican pop-rock singer and songwriter who, since her debut in 2003, has been one of the most successful singers in the pop rock scene in Latin America. Natalia was born in Mexico City, Mexico, to musician parents. Her father is the Chilean musician Gastón Lafourcade, and her uncle is writer Enrique Lafourcade. She grew up in Coatepec, Veracruz, Mexico, where she studied music with her mother, María del Carmen Silva Contreras. In 2003, she was nominated for a Latin Grammy in the Best New Artist category for her debut album. Natalia has captured hearts all over Mexico and in countries across the world—Peru, Chile, Guatemala, Canada, Japan, the United States, Venezuela, Argentina, Spain, Italy, Dominican Republic, Colombia, and Denmark. Throughout her career, Natalia has received numerous honors and awards, including Grammy Awards and MTV Latino awards. Her undeniable talent and success are recognized from the Americas to Europe to Asia. She is an artist with charisma, a creator of contemporary music with immense appeal, and loyal to her musical heritage. Her audiences in all corners of the globe appreciate the simplicity and beauty of her interpretation. She is without a doubt an outstanding representative of the music of Mexico. #RootsTech 2018 will be held on February 28th through March 3rd, 2018 at the Salt Palace in Salt Lake City, Utah at the Salt Palace. You can still register to attend but you might have to look a little harder to find hotel accommodations. 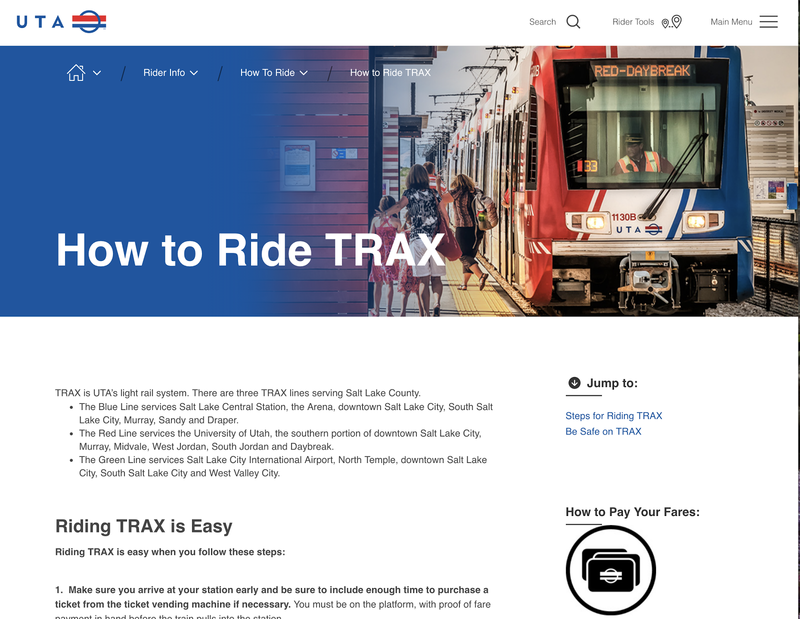 I might suggest that one way to get a good hotel and still attend the Conference is to look for one along the TRAX light rail line that runs south from downtown Salt Lake City to the south end of the valley. You can avoid traffic and have a free place to park at any one of the TRAX stations. Here is a link to the TRAX information. I am always very interested in the actions of Reclaim the Records. So far, they have reclaimed for the public more than twenty million records. As a former attorney, I am amazed that any government agency would resist an FOI request to the point where a lawsuit would be necessary. The government officials must either not be listening to their legal counsel or they have incompetent legal counsel. 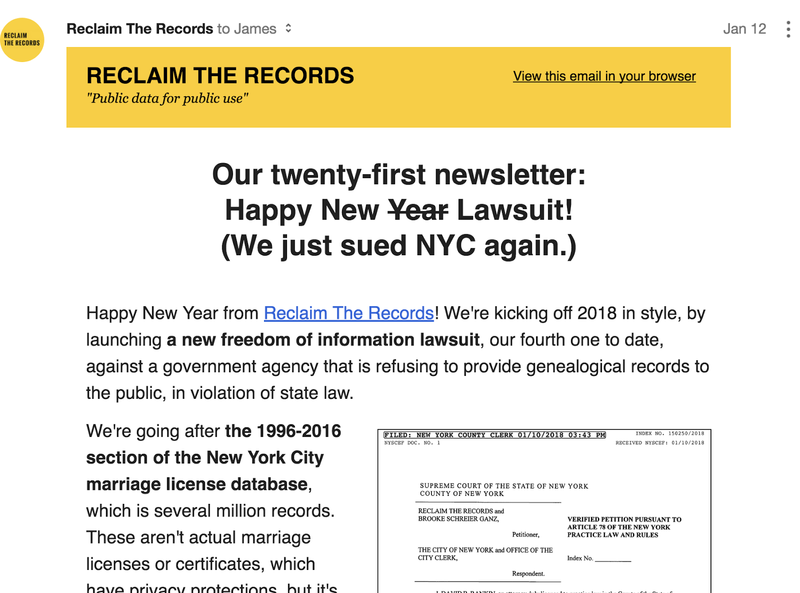 Here is an explanation of Reclaim the Records' most recent action from their current newsletter. You can go to their website to read a lot more about what is going on. Happy New Year from Reclaim The Records! We're kicking off 2018 in style, by launching a new freedom of information lawsuit, our fourth one to date, against a government agency that is refusing to provide genealogical records to the public, in violation of state law. We're going after the 1996-2016 section of the New York City marriage license database, which is several million records. These aren't actual marriage licenses or certificates, which have privacy protections, but it's the text-searchable database index to all of them and to the basic data within. Under New York State law, basic marriage "log" or index data is supposed to be open to the public. As you might remember from previous newsletters, we sued for the 1908-1929 part of this same record set in mid-2015 (newsletter #1 and #2), and we sued for the 1930-1995 section of these records in mid-2016 (newsletter #10 and #11). We won millions and millions of records in our settlements from the city in both cases, and we even won our attorneys fees and court fees in the second case. That was pretty awesome. We posted all the records we won online at the Internet Archive, but also at a new standalone website we developed ourselves called NYCMarriageIndex.com. And several major genealogy websites, both for-profit companies and non-profit organizations, have now added that marriage license data to their own websites. If we win this case too, then this missing 1996-2016 piece of the data will complete the availability of New York marriage records up to almost the present day. And this time around, the data we're seeking is already in a text database, so we won't need an indexing project and researchers will be able to search it right away. This new freedom of information lawsuit -- which, if you want to be pedantic, is really an "Article 78 Legal Petition" -- was filed in the Supreme Court of the State of New York, in the county of New York, two days ago. It's not listed in the online eCourts case tracking system just yet, but it will be shortly; its Index Number is 150250/2018, in case you want to follow along from home. Our superlawyer Dave Rankin is handling the case for us once again, although now he's a partner at a swanky new law firm. As always, we at Reclaim The Records have posted our legal paperwork online, everything from our initial FOIL records request (September 22, 2017) to our FOIL Appeal (November 17, 2017) to our actual Article 78 Legal Petition (filed two days ago). We do this both to demonstrate transparency in our work and to try to inspire other genealogists and researchers that yes, you really can fight city hall (or the city clerk, as the case may be). You can also sign up for their newsletter on their website. On a personal note, I thought I might do my own small part in liberating some records by volunteering to digitize those in the Maryland State Archives. I realize it is a drop in the bucket, but we are getting better at our job and scanned nearly 8000 records this week. We will probably do better as time goes on. What New Technology Will Impact Genealogy? January is the annual Consumer Electronics Show in Las Vegas, Nevada. The largest such gathering in the world involves companies from all over the world. 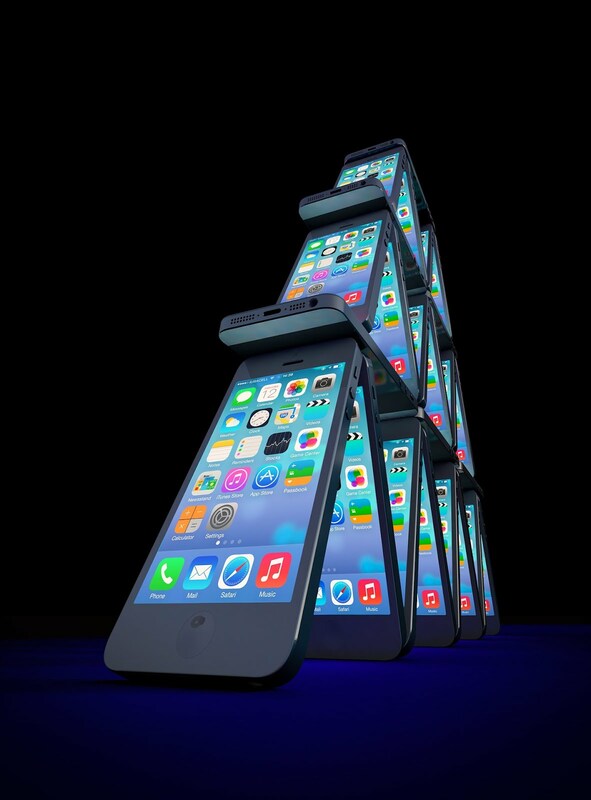 Will any of the sparklingly new technological developments affect the genealogical community? Well, yes as individual consumers, but as genealogists? Will we benefit from the giant screen TVs, self-driving cars, voice-controlled home appliances and virtual reality? Not likely. Was there really anything that will help us do our research or make our genealogical lives easier? Hmm. Probably the biggest impact will come in gradual stages from developments in artificial intelligence. Although this term has been thrown around for a quite a while, the actual developments are subtle and beginning to be pervasive. Real efforts at developing computers that can perform some of the same operations as humans began back in the 1950s. The biggest limitations to any progress were computer hardware limitations. As computers became more sophisticated, their uses became more and more sophisticated also. Those self-driving cars and home voice-activated devices such as Alexa, Echo and Google Home, are the product of years of focusing on the problems associated with artificial intelligence. Where does this technology show up in genealogy? One of the most dramatic implementations is found in the large online genealogy company's record hints. As the number of records searched and the sophistication of the record hints increases, eventually, much of the drudgery of plowing through routine research will be automated. Will computers eventually do all the work of linking our families? Again, not likely, at least not in the foreseeable future. Right now the greatest obstacle to real progress is the lack of a genealogically-based handwriting recognition technology that can be practically implemented in "reading" old handwritten records. Breaching this wall of handwriting will take even more computer power and more sophisticated programs than now exist. What is evident in the genealogical community is that existing, well-developed technologies such as optical character recognition (OCR) and voice-recognition (VR) are vastly underused and ignored. There are millions of typed records online, already digitized, that are available only as images. The larger companies seem to rely on "indexing" more than OCR to provide searchable records. In doing this, they are years behind the current technology. If those involved in providing programs and databases to the genealogical community do not use current technology, how can we expect them to implement cutting-edge new technology? 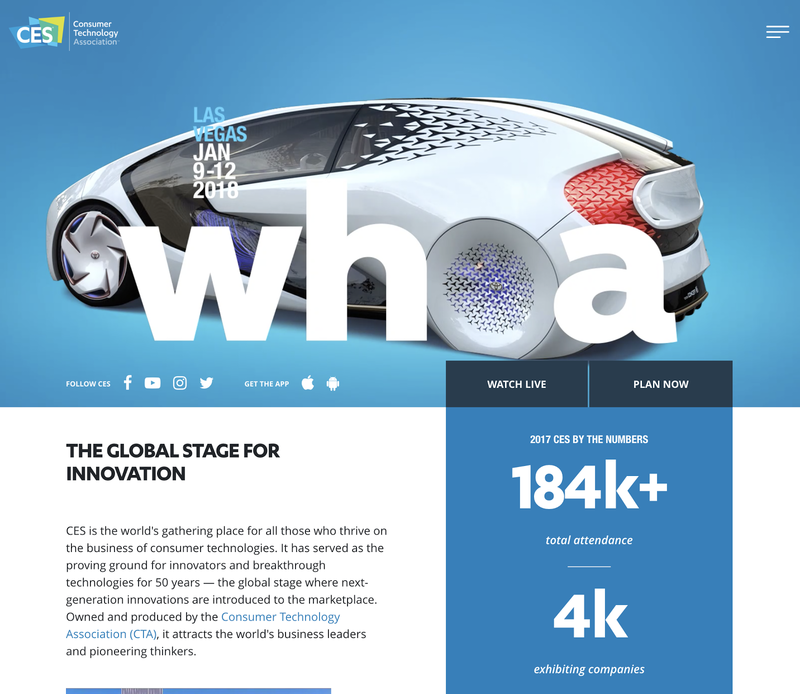 One small development that did come out of CES this year will impact genealogists sooner rather than later. 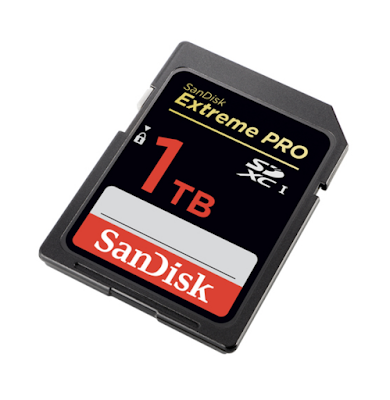 SanDisk announced the development of a 1 Terabyte flash drive and SD disk. Now, we can have the convenience of losing an entire Terabyte of data when we leave our drive in a machine at the Library. 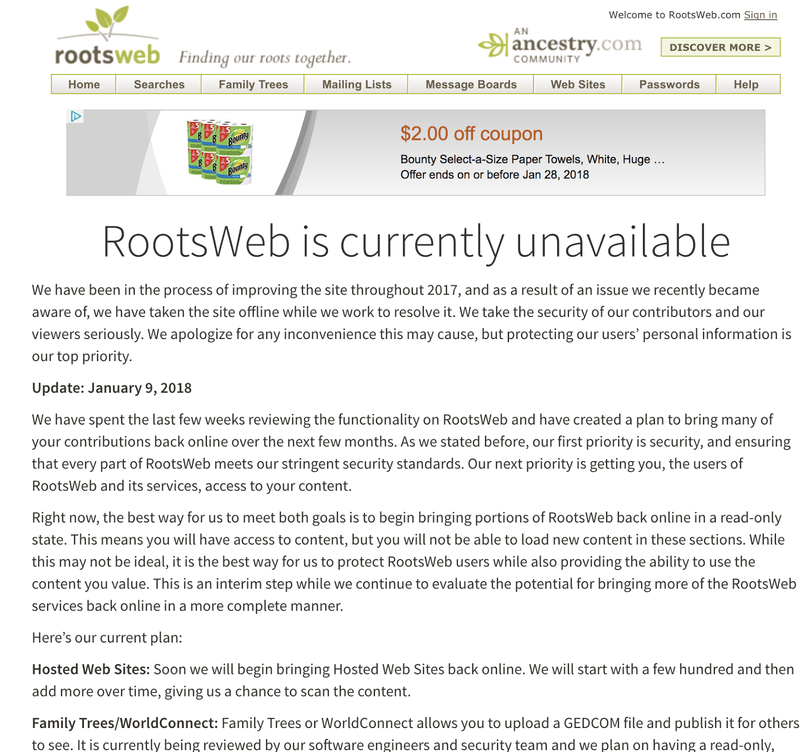 The End of RootsWeb as we know it? RootsWeb is a free genealogy community that uses online forums, mailing lists, and other resources to help people research their family history. Founded in 1993 by Brian Leverich and Karen Isaacson as the Roots Surname List, it is the oldest free online community genealogy research website. Users can upload GEDCOM files of their information for others to search at the WorldConnect portion of the site. Trees uploaded to WorldConnect are searchable at both the RootsWeb and Ancestry websites. RootsWeb was acquired by Ancestry.com in June 2000. The value of Rootsweb is the huge accumulation of information about families and the large number of source citations. It has always been a go-to place for specialized and very complete research information. I am concerned that Ancestry.com, it current owner is going to eviscerate the program just as Ancestry has done with several other valuable genealogical resources in the past. Rootsweb is one of the few legacy websites we still have from the days of the old online forums and bulletin board program from the very early days of the internet. Ancestry's concerns in part have to be based on the fact that Rootsweb is a free program and they are in the business of making money. I may be reading it wrong but Ancestry has passed through some changes in ownership and those entities who own the company are not genealogists. Interestingly, Ancestry has made no press releases as yet in 2018. Here is a quote from the corporate website showing who is running Ancestry.com now. The company’s management team, led by CEO Tim Sullivan, is comprised of seasoned executives with prior experience at companies like Match.com, Martha Stewart Living Omnimedia, eBay, Novell, Zynga, Dropbox, Intuit and Stub Hub. I am not denigrating the value of Ancestry.com, but I am worried about the future. I am going to start to explain the concepts and history of migration patterns with one of most obvious influences in U. S. migration: the Erie Canal. The canals built in the United States opened up vast areas to settlement. 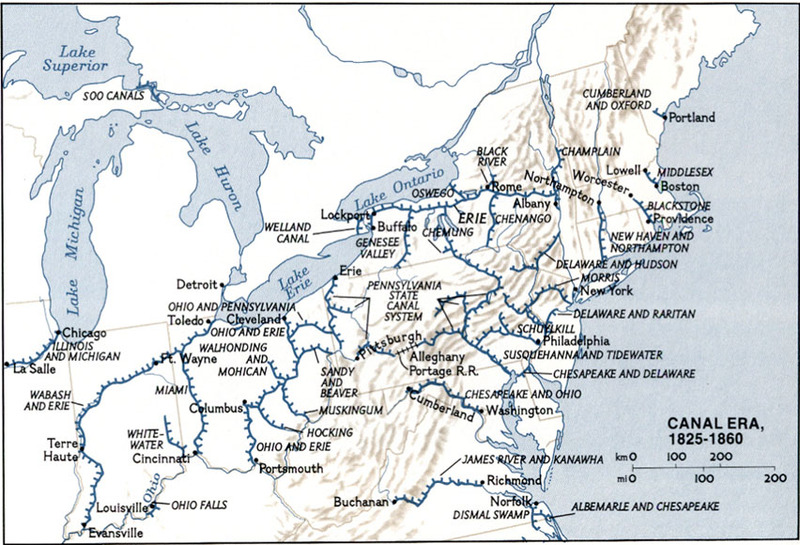 The Erie Canal connected the population centers of New York City and Albany with Buffalo on the Great Lakes. Construction on the Erie Canal began in 1817 and the first sections were completed in 1819. Here is the timeline of completion dates for the Canal. Some of my own ancestors may have used the Canal for transportation because they moved from New York State to Ohio during the time period when the Canal was in operation. The Canal opened a way for large quantities of goods and services to be moved across a significant part of the country where such movement was previously not possible. By connecting that pathway to the Great Lakes, an even larger area of the country was opened up. Now, as a genealogist, what does this tell you about the possible movement of your Eastern Coast ancestors into Ohio and other states? Let's suppose that your ancestors show up in Ohio in the mid-1800s. Where might the family have come from? Here is a more extensive map of the Canals built between 1825 and 1860. It might be interesting to see if the location where your ancestor lived gave them access to one or more of these canals. By looking at the dates the canals were constructed you can begin to see whether further research might reveal a pattern in your ancestors' movements that corresponds to the availability of canal travel. It also might help you to know that the present highways system follows the canal routes. Here is a Google map showing the roads from Albany to Buffalo that generally follow the route of the canal. As I mentioned previously, the major highways in the U.S. are a good indicator of the main historic migration routes. If it is time to do some serious research, here is a list of books about migration patterns in America. American Migration Patterns. Irving, Tex. : Genealogy Tapes, Etc., 1986. Bankston, Carl L. Encyclopedia of American Immigration, 2010. Benmayor, Rina, and Andor Skotnes. Migration and Identity. Oxford; New York: Oxford University Press, 1994. Dollarhide, William. Map Guide to American Migration Routes. Bountiful UT: AGLL Inc.
Elliott, Wendy L. U. S. Migration Patterns. Bountiful, Utah: American Genealogical Lending Library, 1987. Genealogical Institute. American Migration Patterns. Salt Lake City: Genealogical Institute, 1974. Genealogical Institute (Salt Lake City, Utah). American Migrational Patterns. Salt Lake City: Genealogical Institute, 1974. Hawley, George. Voting and Migration Patterns in the U.S, 2015. Kitagawa Otsuru, Chieko. Diversified Migration Patterns of North America: Their Challenges and Opportunities. Osaka: Japan Center for Area Studies, National Museum of Ethnology, 1997. Roseman, Curtis C. Changing Migration Patterns within the United States. Washington: Association of American Geographers, 1977. Schwarzweller, Harry K, James S Brown, and J. J Mangalam. Mountain Families in Transition: A Case Study of Appalachian Migration. University Park: Pennsylvania State University Press, 1971. Whitaker, Beverly DeLong. Migration Patterns in the United States --. Toronto: Heritage Productions, 2003. Where are the genealogy records for India?